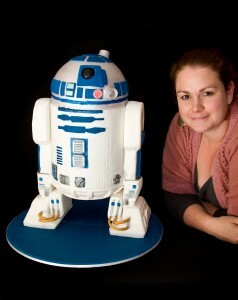 This blog post originally appeared on my Stacked Cakes website. As I no longer make cakes for sale and the site is being shut down I thought I would move it over here. It also seemed very timely with the imminent release for Star Wars VII: The Force Awakens. 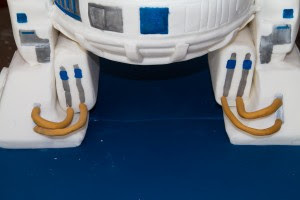 Now you have a step by step guide to create a cake that will delight all the Star Wars Geeks out there. 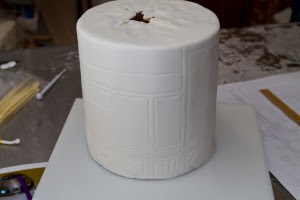 Since the blogs original creation back in March 2012 I have seen so many re-creations of this cake all over the internet, it is great to see all those ambitious cakers taking on a big cake project. 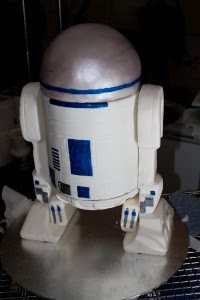 At the time I made this cake I could not find a single example of a free-standing R2D2 cake that did not have a support underneath the main body of the cake and it is exciting to see so many of these on the internet today. 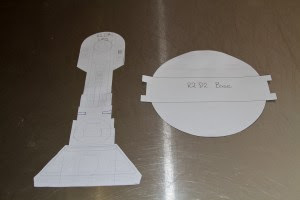 I feel my templates have gone some way in creating this design that so many people have loved and enjoyed which was always my main aim in sharing this type of instructional blog post. You will find the downloadable templates at the end of the post so make good use of those. 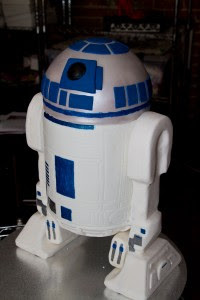 I have had a few people contact me asking for tips and tricks for this cake and my biggest tip would be that if you have far to transport this cake that I would recommend assembling it on site. As the cake is up on legs it is top heavy and I would not recommend driving any distance with it if you want it to arrive intact. I also wouldn't recommend this cake for beginners but I did originally make this cake with no instruction on heavily constructed cakes so don't feel you have to be an expert either. The other big question I get asked is where I got the sound module from. We ordered these from Ebay, I couldn't tell you the original seller now, it has been many years. They are the sound modules that you get in greeting cards but you specifically want the ones you can record onto yourself. 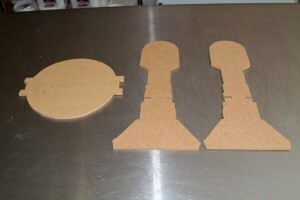 They are very cheap and quite small so a great little trick that you can add into so many cakes. I have known decorators to mount them under the cake board in an indented space so the recipient gets their own personalised birthday message with their cake. 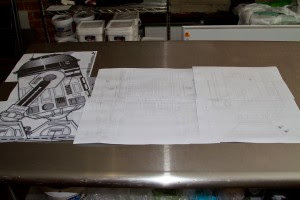 I have also expanded on the descriptions that go with the photos, the more information I can give you the better position you will be in to get this cake built. 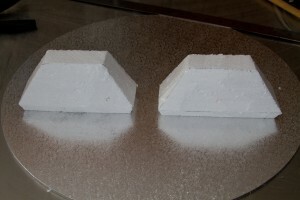 I know some people are purists and do not want to make cakes with any styrofoam in them. 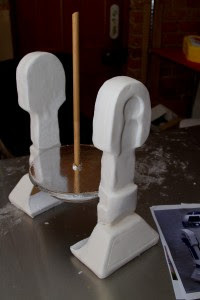 If you wish you can replace the styrofoam on the legs with cake, the ganache should hold it in place even though it is vertical. 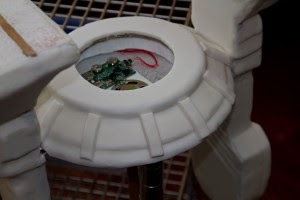 In my opinion it adds a lot of uncessessary weight to the finished cake which can make transportation even more difficult and in the end most people just don't need that much cake. It will be thrown out in the end so I recommend saving yourself the trouble and using styrofosm. Let's be honest, 95% of this cake is made from real cake and that should be enough for anyone. So here is the original post, enjoy! 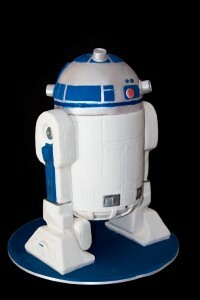 We finally got a request for an R2D2 cake. 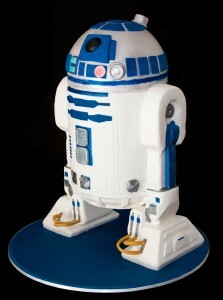 We have enjoyed making our previous sci-fi themed cakes and were looking forward to making a Star Wars favorite. We decided we wanted him to be able to stand up properly without a support under him. 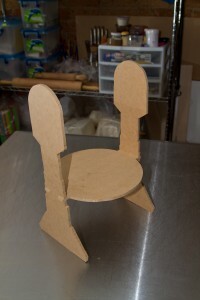 This necessitated making his legs and feet out of non-edible, structural materials (wood and polystyrene). His body and head is made entirely out of choc mud cake and icing. 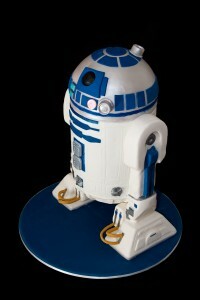 R2D2 was the perfect opportunity to add a sound module to one of our cakes. 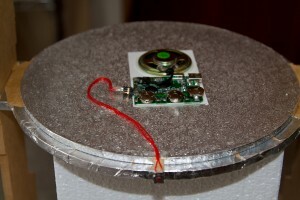 These modules allow the cake to make any noise you can imagine with the push of a button. Music, sound effects, engine noises, talking, anything at all is possible. 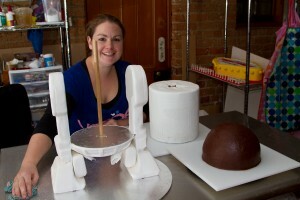 Please let us know if you want to add the special touch of sound to your next stacked cake. 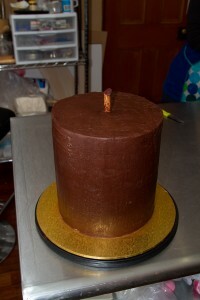 Any advice on scaling this cake down to fit 6" rounds? Thank you! If you scale all the templates down to 66% of their full size it should probably work out for you. You would probably need one less cake stacked for the body too. 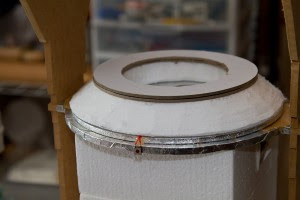 It is a little tricky because cakes never end up the exact specified size because of height variations, shrinking and tins are never the same size. Hi,where is the link to the templates? The text "Templates are available for download" should be the link you are after. 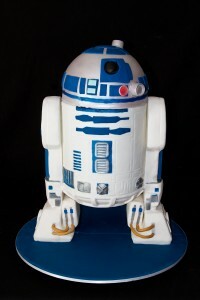 Are there templates for the actual designs on the cake - placement? Hi Mary, sorry I don't produce any of the parts for this cake to sell. 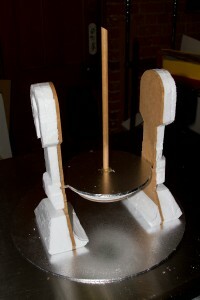 A hand held jig-saw is what you need to cut out custom cake boards. They are really very easy to use, I would recommend giving it a go.